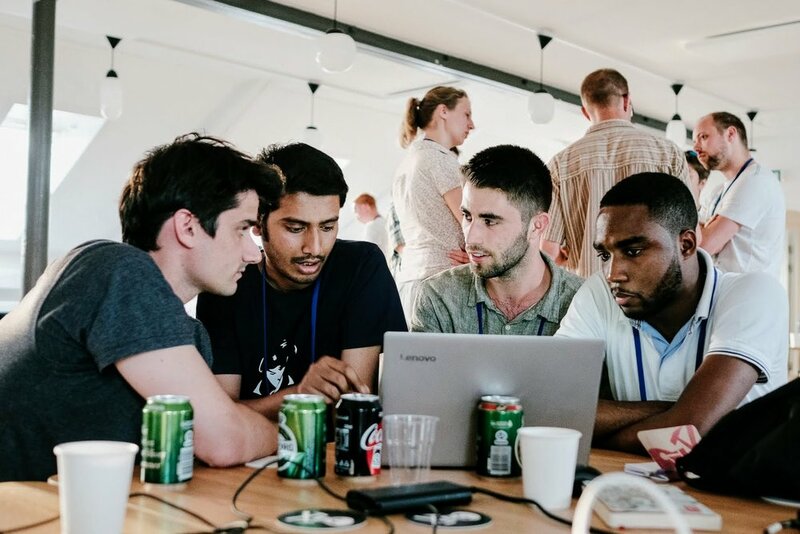 In Part 1, I wrote about six of the projects teams contributed at the Subsurface Hackathon in Copenhagen in June. Today I want to tell you about the rest of them. Team GeoClusterFu...n: Dan Stanton (University of Leeds), Filippo Broggini (ETH Zürich), Francois Bonneau (Nancy), Danny Javier Tapiero Luna (Equinor), Sabyasachi Dash (Cairn India), Nnanna Ijioma (geophysicist). Tech: Plotly Dash. GitHub repo. Project: The team set out to build an interactive web app — a totally new thing for all of them — to make interactive plots from data in a CSV. They ended up with the basis of a useful tool for exploring geoscience data. Project page. Four sixths of the GeoClusterFu...n team cluster around a laptop. Team SmARt_OGs: Brian Burnham (University of Aberdeen), Tala Maria Aabø (Natural History Museum of Denmark), Björn Wieczoreck, Georg Semmler and Johannes Camin (GiGa Infosystems). Tech: ARKit/ARCore, WebAR, Firebase. GitLab repo. 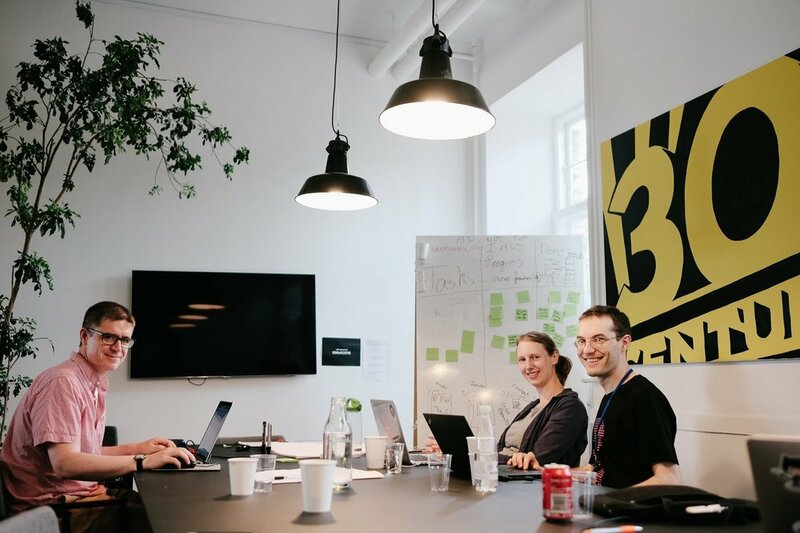 Project: Bjørn and his colleagues from GiGa Infosystems have been at all the European hackathons. This time, he knew he wanted to get virtual outcrops on mobiles phones. He found a willing team, and they got it done! Project page. Three views from the SmartOGs's video. See the full version. The Embedders: Lukas Mosser (Imperial College London), Jesper Dramsch (Technical University of Denmark), Ben Fischer (PricewaterhouseCoopers), Harry McHugh (DUG), Shubhodip Konar (Cairn India), Song Hou (CGG), Peter Bormann (ConocoPhillips). Tech: Bokeh, scikit-learn, Multicore-TSNE. GitHub repo. Project: There has been a lot of recent interest in the t-SNE algorithm as a way to reduce the dimensionality of complex data. The team explored its application to subsurface data, and found promising applications. Web page. Project page. The Embeders built a web app to cluster the data in an LAS file. The clusters (top left) are generated by the t-SNE algorithm. Team Hands On GeoLabs: Will Sanger (Western Geco), Chance Sanger (Houston Museum of Fine Arts), Pierre Goutorbe (Total), Fernando Villanueva (Institut de Physique du Globe de Paris). 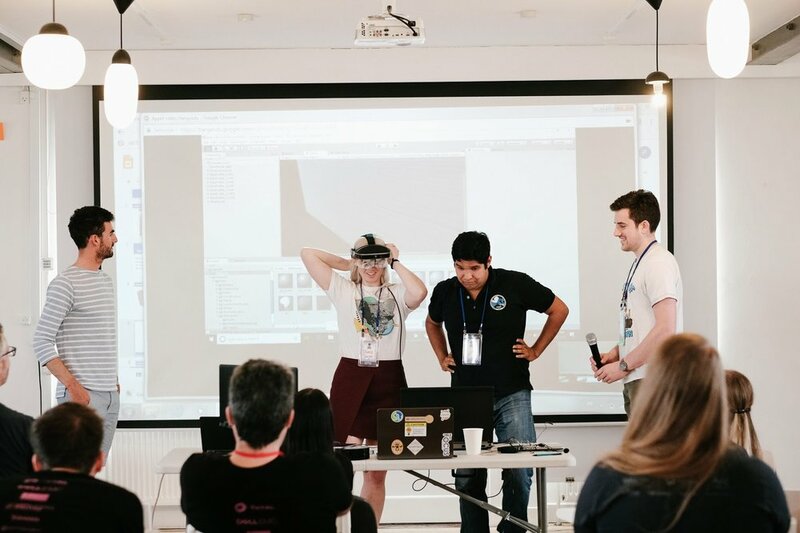 Project: Starting with the ambitious goal of combining the mixed reality of the Meta AR gear with the mixed reality of the Gempy sandbox, the team managed to display and interact with some seismic data in the AR headset, which allows interaction with simple hand gestures. Project page. The team demonstrate the Meta AR headset. Project: Paul and his team wanted to visualize hundreds of millions or billions of grid cells — all in the browser. They ended up with about 20 million points working very smoothly, and impressed everyone. Project page. Tech: Python, react.js. GitHub repos: Client. Backend. Project: Spectral decomposition is still a mostly quantitative tool, especially the interpretation of RGB-blended displays. This team set out to make intuitive, attractive forward models of the spectral response of wells. 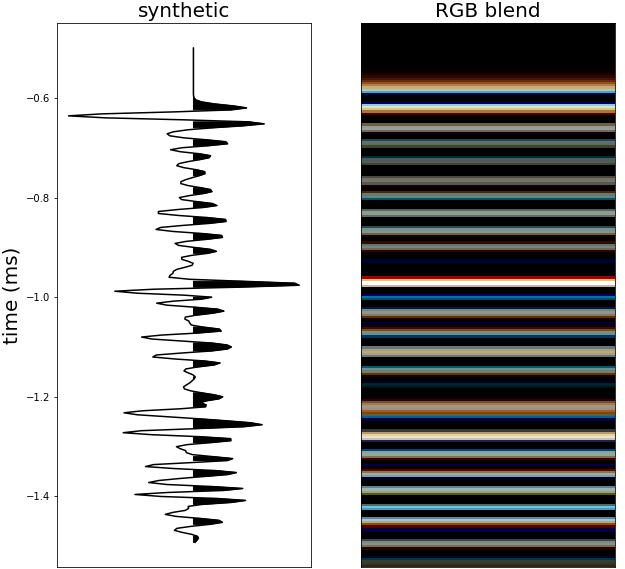 This should help interpret seismic data, and perhaps make more useful RGB displays too. Intriguing and promising work. Project page. That's it for another year! 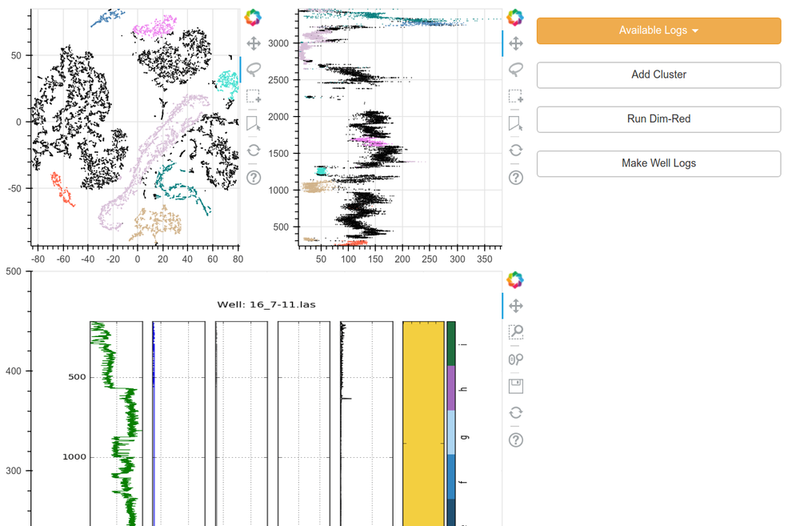 Twelve new geoscience visualization projects — ten of them open source. And another fun, creative weekend for 63 geoscientists — all of whom left with new connections and new skills. All this compressed into one weekend. If you haven't experienced a hackathon yet, I urge you to seek one out. I will leave you with two videos — and an apology. We are so focused on creating a memorable experience for everyone in the room, that we tend to neglect the importance of capturing what's happening. Early hackathons only had the resulting blog post as the document of record, but lately we've been trying to livestream the demos at the end. Our success has been, er, mixed... but they were especially wonky this time because we didn't have livestream maestro Gram Ganssle there. So, these videos exist, and are part of the documentation of the event, but they barely begin to convey the awesomeness of the individuals, the teams, or their projects. Enjoy them, but next time — you should be there! It's finally here! The round-up of projects from the Subsurface Hacakthon in Copenhagen last month. This is the first of two posts presenting the teams and their efforts, in the same random order the teams presented them at the end of the event. Team Geo Go: Karine Schmidt, Max Gribner, Hans Sturm (all from Wintershall), Stine Lærke Andersen (University of Copenhagen), Ole Johan Hornenes (University of Bergen), Per Fjellheim (Emerson), Arne Kjetil Andersen (Emerson), Keith Armstrong (Dell EMC). 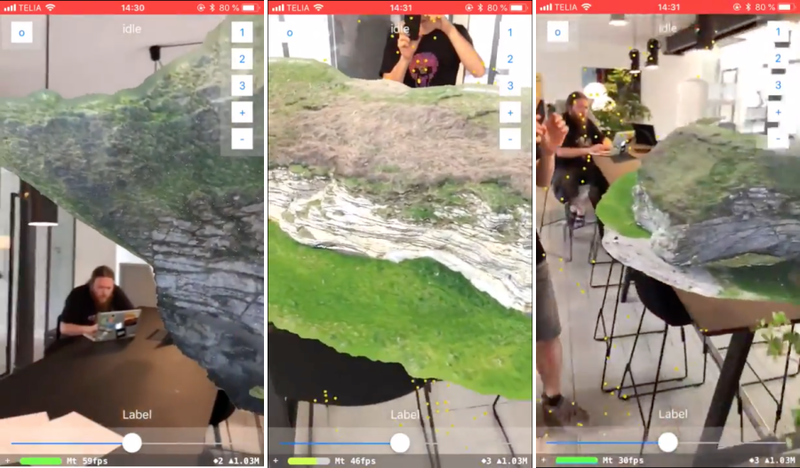 Project: With Pokemon Go as inspiration, the team set out to prototype a geoscience visualization app that placed interactive subsurface data elements into a realistic 3D environment. Team Blind Spots: Jo Bagguley (UK Oil & Gas Authority), Duncan Irving (Teradata), Laura Froelich (Teradata), Christian Hirsch (Aalborg University), Sean Walker (Campbell & Walker Geophysics). Tech: Flask, Bokeh, AWS for hosting app. GitHub repo. Project: Data management always comes up as an issue in conversations about geocomputing, but few are bold enough to tackle it head on. This team built components for checking the integrity of large amounts of raw data, before passing it to data science projects. Project page. Sean, Laura, and Christian. Jo and Duncan were out doing research. Note the kanban board in the background — agile all the way! Team Fortuna: Natalia Shchukina (Total), Behrooz Bashokooh (Shell), Tobias Staal (University of Tasmania), Robert Leckenby (now Agile! 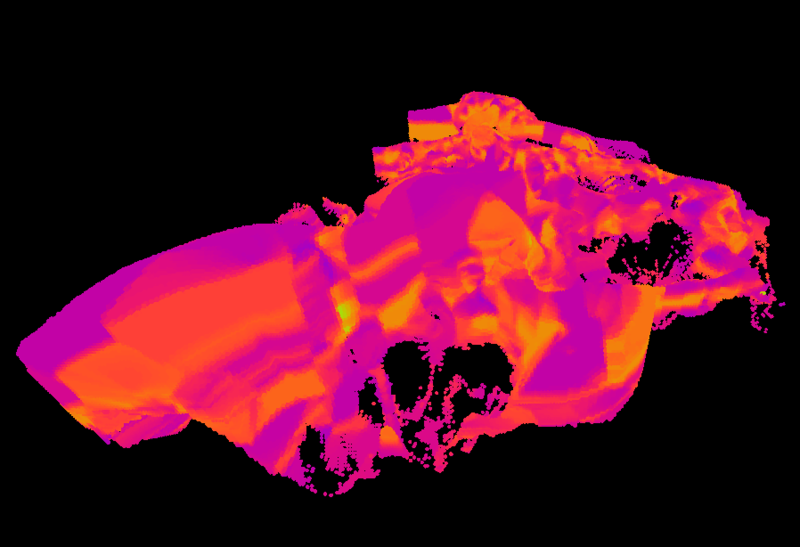 ), Graham Brew (Dynamic Graphics), Marco van Veen (RWTH Aachen). Tech: Flask, Bokeh, Altair, Holoviews. GitHub repo. Project: Natalia brought some data with her: lots of surface grids. The team built a web app to compute uncertainty sections and maps, then display them dynamically and interactively — eliciting audible gasps from the room. Project page. 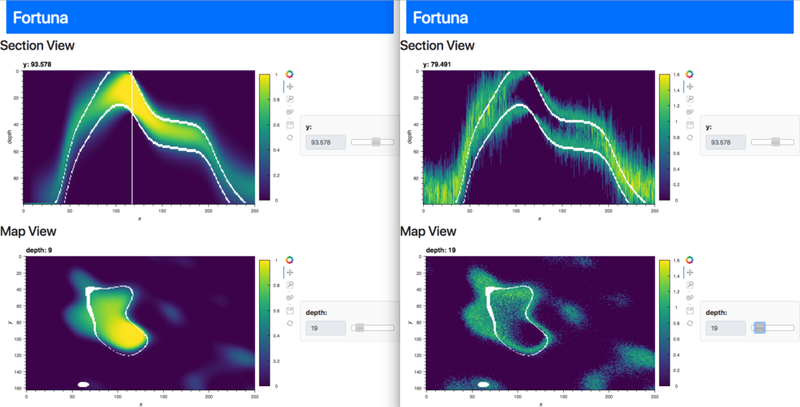 The Fortuna app: Probability of being the the zone (left) and entropy (right). Cross-sections are shown at the top, maps on the bottom. Team RGBlend: Melanie Plainchault and Jonathan Gallon (Total), Per Olav Svendsen, Jørgen Kvalsvik and Max Schuberth (Equinor). Tech: Python, Bokeh. GitHub repo. Project: One of the more intriguing ideas of the hackathon was not just so much a fancy visualization technique, as a novel way of producing a visualization — differencing 3 images and visualizing the differences in RGB space. It reminded me of an old blog post about the spot the difference game. Project page. The differences (lower right) between three time-lapse seismic amplitude maps. Team AR Sandbox: Simon Virgo (RWTH Aachen), Miguel de la Varga (RWTH Aachen), Fabian Antonio Stamm (RWTH Aachen), Alexander Schaaf (University of Aberdeen). Project: I don't have favourite projects, but if I did, this would be it. The GemPy group had already built their sandbox when they arrived, but they extended it during the hackathon. Wonderful stuff. Project page. 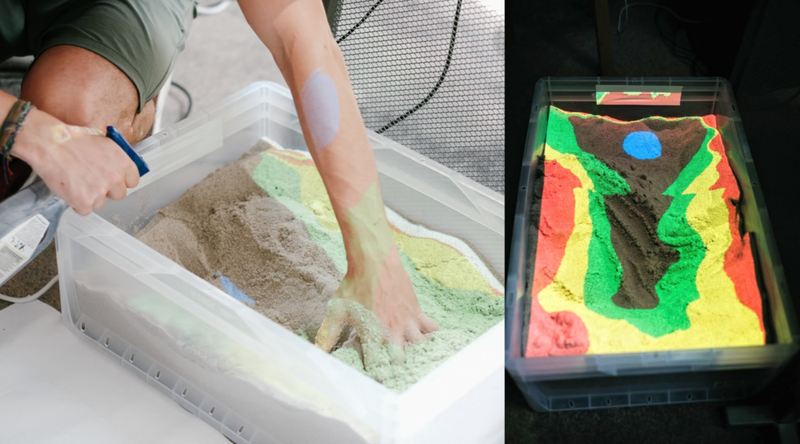 magic box of sand: Sculpting a landscape (left), and the projected map (right). You can't even imagine how much fun it was to play with. Team Sandbox Seismics: Yuriy Ivanov (NTNU Trondheim), Ana Lim (NTNU Trondheim), Anton Kühl (University of Copenhagen), Jean Philippe Montel (Total). Tech: GemPy, Devito. GitHub repo. Project: This team worked closely with Team AR Sandbox, but took it in a different direction. They instead read the velocity from the surface of the sand, then used devito to simulate a seismic wavefield propagating across the model, and projected that wavefield onto the sand. See it in action in my recent Code Show post. Project page. Yuriy Ivanov demoing the seismic wavefield moving across the sandbox. Pretty cool, right? As usual, all of these projects were built during the hackathon weekend, almost exclusively by teams that formed spontaneously at the event itself (I think one team was self-contained from the start). If you didn't notice the affiliations of the participants — go back and check them out; I think this might have been an unprecedented level of collaboration! Before you go, check out this awesome video Wintershall made about the event. A massive thank you to them for supporting the event and for recording this beautiful footage — and for agreeing to share it under a CC-BY license. Amazing stuff! We're in Copenhagen for the Subsurface Bootcamp and Hackathon, which start today, and the EAGE Annual Conference and Exhibition, which starts next week. Walking around the city yesterday, basking in warm sunshine and surrounded by sun-giddy Scandinavians, it became clear that Copenhagen is a pretty special place, where northern Europe and southern Europe seem to have equal influence. The event this weekend promises to be the biggest hackathon yet. It's our 10th, so I think we have the format figured out. 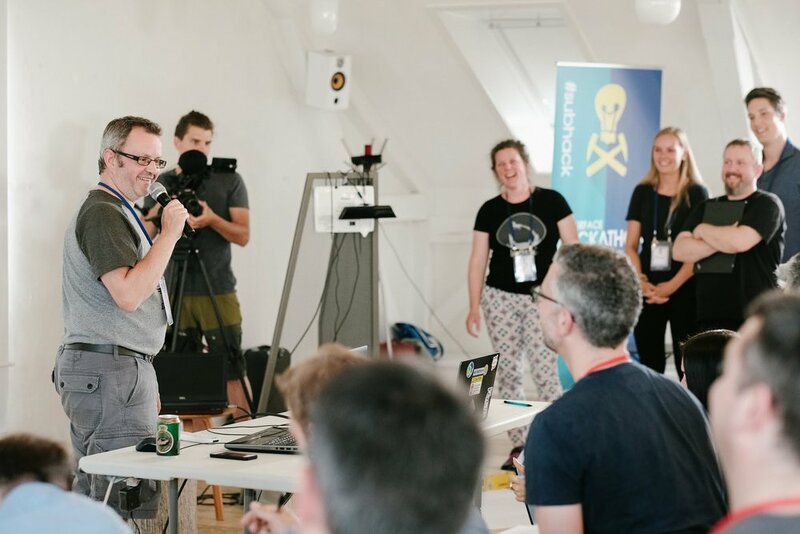 But it's only the third in Europe, the theme — Visualization and interaction — is new for us, and most of the participants are new to hackathons so there's still the thrill of the unknown! Many thanks to our sponsors for helping to make this latest event happen! Support these organizations: they know how to accelerate innovation in our industry. By the way, we just announced two new hackathons, one in London and one in Aberdeen, for the autumn. They are happening just before PETEX, the PESGB petroleum conference; find out more here. You can skill up for these events at some new courses, also just announced. The UK Oil and Gas Authority is offering our Intro to Geocomputing and Machine Learning class for free — apply here for a place. The courses are oversubscribed, so be sure to tell the OGA why you should get a place! WS02 Data Integration in Geoscience - Perspectives for Computational Methods, although it only contains 4 talks so I'm not sure if that means it will be short, or contain a lot of discussion (which would be cool). Seismic Interpretation I - Automation through AI, Machine Learning, Deep Learning, with an accompanying poster session. Evan reported on this session last year. Geothermal Solutions I (Dedicated Session) and Geothermal Solutions II — we always enjoy geothermal sessions. And geothermal is hot right now (heh, no but seriously, it is). Computational Geoscience and Data/information Management, including the talk Digitalization in subsurface learning, which sounds interesting but apparently you can't read abstracts online so who knows. There's lots of other stuff of course — EAGE has the most varied programme of any subsurface conference — but these are the sessions I'd be at if I had time to go to any sessions this year. But I won't because The hackathon is not all that's happening! Next week, starting on Tuesday, we're conducting a new experiment with the Code Show. In partnership with EAGE and Total, this is our attempt to bring some of the hackathon experience to everyone at EAGE. We'll be showing people the projects from the hackathon, talking to them about programming, and helping them get started on their own coding adventure. So if you're at EAGE, swing by Booth #1830 and say Hi.